"The NBA operates under a salary cap that not only limits the total amount a team can spend on the combined salaries of all players, but also places a ceiling on the amount that individual players can earn. As a result, top players with similar years of service in the league make roughly the same salary regardless where they play. Since the maximum salary available to an elite level player varies little from one team to the next, state and local income tax rates play the greatest role in determining the difference in how much money star players ultimately pocket from team to team. Exhibit A: When LeBron James famously ditched the Cleveland Cavaliers for the Miami Heat last summer, it was estimated that he would save $25 million in state taxes over the next five years by playing in income tax free Florida rather than Cleveland, where combined city and state income taxes approach 8%. There is a clear pattern of talented players migrating to, or staying with, teams in states with little or no personal income tax. Since they can more easily attract and keep better players, teams in states with lower taxes have consistently performed better on the court than teams in highly taxed states in recent seasons. Over the past seven years, teams based in the 10 lowest taxed cities in the NBA reached the NBA Finals seven times, winning four championships (Dallas, Miami and San Antonio, twice). In contrast, only three times did one of the 10 teams that play in the NBA markets with the highest income tax burdens reach the Finals. The trend continued this season when seven of the teams located in the NBA’s 10 lowest taxed cities made the playoffs. This year’s playoffs featured only three teams in the 10 highest taxed NBA cities. During the 2010-11 NBA season, the 10 teams playing in the cities with the lowest income tax burden averaged a stout 57.8% winning percentage. The 10 teams playing in the cities with the highest income tax burden combined for a paltry 39.3% winning percentage." MP: The chart above (click to enlarge) displays a regression analysis that supports Drew's findings (each blue dot represents an NBA team). 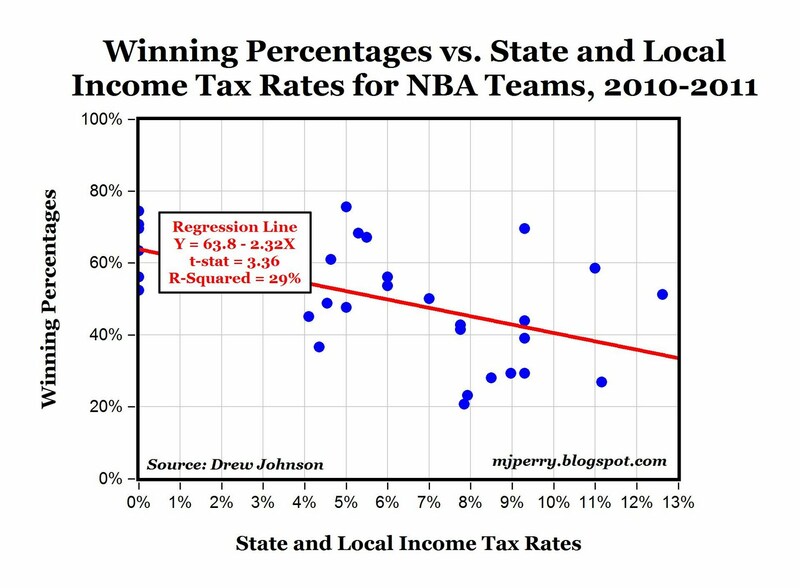 For the 2010-2011 season there was a statistically significant negative relationship (at the 1% level) between: a) the winning percentage for NBA teams, and b) the combined state and local income tax rates for an NBA team's home state. That is, the higher (lower) the income tax burden of an NBA team's home state the lower (higher) the winning percentage for that team. 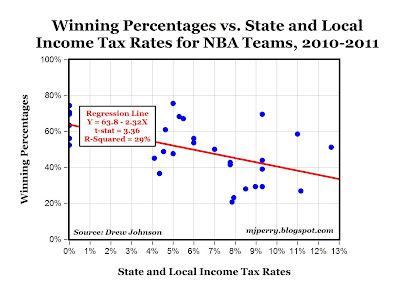 From the regression equation, we can quantify the relationship as follows: For every one percentage point increase (decrease) in the combined state and local income tax rate in the state of an NBA team, the winning percentage of that team decreases (increases) by 2.33 percentage points (and that relationship is statistically significant at the 1% level, with a t-statistic of 3.36). Great post.... an obvious result once one thinks about it... which I had not done till now. The conclusion is probably true but the setup is misleading. The NBA salary cap is a soft cap with a luxury tax, meaning teams can still spend a lot if they want. Dallas may gain from having no income tax but they gained a lot more from having the highest payroll after the Lakers, around $85 million, well over the "cap" of $58 million. Moving to a "hard cap" is a giant point of contention in the current lockout. Also, the bit about elite players making similar salaries is misleading because he tucked in the caveat earlier about "similar years of service." The MVP last year, Derrick Rose, only made $5.5 million from the NBA this year, while Kobe Bryant raked in almost $25 million, mostly because he's been around a lot longer. So the number of years you've put in makes a huge difference in your salary. Considering these giant variations, any realistic assessment of the impact of taxes would also have to adjust for these other factors. New York city residents must pay the very high New York state income tax and New York city resident tax (administered by the state). The outcome for the Knicks and Nets is probably zero chance of winning the NBA championship. And I thought they were playing for glory...for the fans...for the little boy in hospital they visited. This is not a very convincing regression. The r^2 is not given and looks to be low. Also, the slope is not given, and it depends strongly on 4 data points at 0% tax. This plot reminds me of the early versions of Excel, which produced trend lines but absolutely no statistics. Economists do know that trend lines come with all sorts of stats and significance tests and confidence limits, don't they? The conclusion may be expected from the micro-economic viewpoint, but the chart doesn't prove it. The conclusion may well be true but with an R-Squared of 29 percent I disagree that the data are convincing. You want the slope calculate it either from the graph or the equation. If we grant that people work harder when they make more take home pay, then what again is the argument against the minimum wage? And why do the Yankees win every year? @Benji - The argument against minimum wage was never that if you pay people more, they work less hard. The nutshell version is that when you raise the cost of labor you get less of it; ie fewer people working because the business owner cannot afford it. There is a strong correlation between the increase in minimum wage and the decrease in teen employment. And the Yankees have only won one out of the last ten World Series. "If we grant that people work harder when they make more take home pay, then what again is the argument against the minimum wage?" But we don't grant that. It's just the opposite. when people work harder they make more pay. "And why do the Yankees win every year?" Highly paid sports figures don't become superstars because they are offered huge salaries, they can demand high salaries because they are superstars, and can contribute more to the team's bottom line than they are paid. I always got the impression when a superstar made several tens of millions, he really didn't play that hard anymore. He already had $40 million in the bank. There is such a thing as a backward bending supply curve. "I always got the impression when a superstar made several tens of millions, he really didn't play that hard anymore. He already had $40 million in the bank." I guess that could be true if he has no interest in playing when his current contract expires, as he won't likely get another one. I suppose there could also be performance clauses that require some level of performance, or no big bucks. And how do you explain Manny Ramirez? "And how do you explain Manny Ramirez?" Can anyone say, "Omitted variable bias"? BTW, I guess high city incomes taxes and good baseball are correlated. The Yanks won the World Series in 2000, lost the World Series in 2001, made the playoffs in 2002, lost the WS in 2003, made the playoffs in 2004, made playoffs in 2005, made playoffs in 2006, made playoffs in 2007, won the series in 2009, made playoffs in 2010. The Yanks also won the WS in 1996, 1998, 1999. I guess if you tax ballplayer income heavily, they play harder. as far as I can tell, no team from AZ or TX ever won a WS, and FL just twice. The upshot? You can prove anything you want. MLB does not have a salary cap. Due to their revenues, teams such as the Yankees, Red Sox and Cubs can overpay players enough to offset the loss in salary created by local taxes compared to teams such as the Rangers, Astros, Mariners and Rays who play in income tax-free areas. Tax rates really only impact leagues with a hard cap - or that limit player salaries (as the NBA does now). When the NBA comes back from their lockout, there will likely be a very hard salary cap and harsher limits on max player salaries. As a result, local tax burdens will become an even greater factor than they have been. And the D-Backs won a World Series in 2001. New Milestone for "New Age of Energy Abundance"
But At Least the Politicians Care... In Theory.